Posted by rawkfistmusic in 2009, Hoobastank. Alright mainstream music fans, time to test your chops. Remember Hoobastank and their 2004 breakout hit “The Reason”? Good for you! Now forget that song every existed and think about what else you know about this four piece California-based band. Nothing you say? I thought so. Now reward yourself with a snack while I break down exactly what these guys have been up to for the last five years, and where exactly this largely mediocre band stands with their newest release, the confusingly titled For(N)ever. Were I nothing more than a casual radio listener, I would call Hoobastank brilliant. The great singles from their first two albums are numerous, but the rest of each album was sadly forgettable. Even more so, their 2006 release “Every Man For Himself” was entirely unnoticeable on most fans’ radars, and I was honestly surprised to ever see this band again. Yet here they are, showing me who’s who with their addictive new single “My Turn.” It’s mainstream radio rock at it’s finest, mind-numbingly simple, but brilliantly orchestrated with lyrics like “When’s it gonna be my turn,” to turn into a huge concert anthem. Okay, granted, I knew this band could produce decent singles, and I fully expected this album to do exactly what all their others had. Turns out, it’s Hoobastank’s turn indeed, as this album is the best they’ve put together yet. “I Don’t Think I Love You” is the next track, and is set up nicely to be the next single. As I expected again, it’s simple and catchy, and the lyrics are even a bit more meaningful this time. It’s great hard rock that should get a fair amount of radio play. Then the surprise kicks in with “So Close, So Far,” which puts frontman Doug Robb’s surprisingly passionate falsetto voice out for all to hear at key moments. It’s not there for long, but it serves as the only hook the song needs. Turns out, that’s the kind of formula Hoobastank has decided to work with this time around. Good ole’ rock and roll hooks, whether it be by voice or vibration, are ever-present on For(N)ever, and slowly but surely, you’ll start enjoying this offering. The heavy hitters are no doubt tracks like “All About You,” “Gone Gone Gone,” and “Sick of Hanging On.” Each one contains Hoobastank’s usual jam session type sound, but this time around are filled with far more punch and hook (left or right? Get it, it’s a boxing joke). Then there’s the power ballad type numbers such as “The Letter” which begins with a haunting and addictive progression that almost completely makes up for the rest of a relatively uneventful track. There’s the weakness here though. 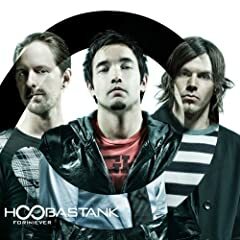 Even though Hoobastank got most of their fame out of the super slow “The Reason,” their attempts to replicate it with more ballads comes up mostly flat, as “You Need To Be Here” and “You’re The One” are not only cliche and bland, but easily the worst tracks on the disc. Hoobastank’s general flaws are still out for all to see. There’s a general lack of passion in some of the songs, while others just don’t have any sort of hook or memorable moment. The instrumentation is rather blah-worthy at times, and Robb’s voice is not enough for him to carry the album on his own. For all the praise I slapped down at Hoobastank, there’s still plenty of room to pick up the pieces (Hoobastank fans will get that one) and get a really solid album out the door. As it stands, For(N)ever is a surprisingly solid release with a lot of great qualities for casual listeners. It’s easy to sit back and enjoy this album, and many people will. Once more however, Hoobastank lacks enough of anything special to make this album stand out. As far as I’m concerned this album deserves a 4 at best. I couldn’t even listen to the whole album. Absolute trash.